The number of research reports studying the robotics industry is growing exponentially. To date in 2016 there have been 109 on subjects ranging from overly broad to very drilled-down views of the industry. Prices range from $800 to $6,500. Below are short profiles of 62 of those reports and the other 47 can be seen here. Many of the reports duplicate the coverage of others and frequently differ in their forecasts about the future. Some reports are marginally useful, others are full of valuable information. Bottom line: almost all of the reports are forecasting positive double-digit growth for most segments of the robotics industry. Consistent with previous reports, and with The Robot Report‘s monthly fundings, acquisitions and IPOs recaps, the drone segment has the most activity – 35 of the 109. The official industry reports, which tabulate the results from all the robot associations around the globe, produced by the International Federation of Robotics, appear at the bottom. Frost & Sullivan, in a May 2016, 95-page $4,950 report, analyzed the top 10 technologies in advanced manufacturing and automation. Their list includes: additive manufacturing, digital manufacturing, collaborative robotics, agile robots, exoskeletons, micro manufacturing, multi-material joining, composites manufacturing, UUVs, and Maglev. The global industrial robotics market is expected to reach $79.58 billion by 2022, growing at a CAGR of 11.92% between 2016 and 2022. The analysts forecast the European industrial robotics market to grow at a CAGR of 8.42% during the period 2016-2020. Forecasts the industrial robotics market in APAC to grow at a CAGR of 8.7% during the period 2016-2020 in the top 5 segments: automotive, food & bev, industrial machinery, electronics and semiconductor, and other (includes oil and gas, pharmaceutical, plastic and rubber, and heavy industries). An analysis of the APAC countries use and planned use by market, component and application. Forecasts the global robot machine tools market to grow at a CAGR of 5.13% during the period 2016-2020. Predicts the global industrial robotics market in the rubber and plastic industry to grow at a CAGR of 18% through 2020. Global assembly robots market is expected to see fast growth and rapid change during the period 2016-2022. Annual shipment and sales revenue in this sector are expected to see two-digit CAGRs over the period 2016-2022. The global security robots market was valued $1.34 billion in 2015 and is forecast to reach $2.36 billion by 2022, at a CAGR of 8.56% between 2016 and 2022. The global market for construction robots will exhibit steady 5% CAGR growth during the forecast period to 2020. Forecasts the global military robots market to grow at a CAGR of 9.36% during the period 2016-2020. The report predicts the global public relation robots market to grow at a CAGR of more than 26% through 2020. One of the primary drivers for this market is the rising need to improve productivity and efficiency in the hospitality sector. Predicts the global educational robots market to grow at a CAGR of more than 21% through 2020. Expected to grow from $6.97 billion in 2014 to $18.02 billion by 2020 at a CAGR of 17.36% between 2015 and 2020. The global market for entertainment robots and guides will grow at a CAGR of over 20% from 2016 to 2020. Market is expected to witness an exponential growth, with annual shipment and sales revenue from hardware and software growing at more than 42% annually through 2022. Forecast the global mobile robotics market to grow at a CAGR of 12.21% during the period 2016-2020. Notes that battery-less AGVs are gaining market momentum because AGVs can work longer shifts without recharging. The Unmanned Surface Vehicle (USV) market is projected to grow from $437.57 million in 2016 to $861.37 million by 2020, at a CAGR of 14.51%. The 5G-enabled autonomous robot market (which includes robotics, IoT, big data and analytics, and AI companies) is forecast to reach $14.6 billion by 2030. North America will lead the 5G-enabled autonomous robot market with a 41% revenue share. Forecasts the smart machines market in the Americas to grow at a CAGR of 14.96% during the period 2016-2020. Artificial Intelligence market forecast to grow from $419.7 million in 2014 to $5.05 billion by 2020, at a CAGR of 53.65% from 2015 to 2020. Forecasts the global robotic software platforms market to grow at a CAGR of 4.17% during the period 2016-2020. Overall robotics market for industrial IoT will be worth $45.73 billion by 2021. The global telepresence robots market is forecast to record a CAGR of more than 53% until 2020. Automated material handling market – including robotic solutions – estimated to be worth $18.55 bn in 2015 and will expand to $33.6 bn by the end of 2021 at a CAGR of 10.4%. Forecasts that the sector will register a 32% CAGR through 2020. Unit shipments and sales revenue for the material handling robots sector are forecast to be two-digit CAGRs over the period of 2016-2022. Includes profiles of Amazon, Hitachi, Swisslog, Hi-tech Robotic Systemz, GreyOrange and Fetch Robotics. Truck platooning is perceived as the future of the transportation industry. Multiple trucks travel at an aerodynamically efficient distance and drive cooperatively by maintaining the distance. EU holds a clear lead for truck platooning by 2025. ADAS (advanced driver assistance systems include automated cruise control, parking assistance, collision avoidance, rear view, blind spot detection, speed control, driver drowsiness alert, etc.) shipments expected to reach 60.5 million units by 2022. The agriculture drones market Is forecast to reach $4.2 billion by 2022. Industry to grow to over $7.6 billion by 2022. Global agricultural drones market is expected to surpass $3.5 billion while agriculture robotics market is expected to exceed $8.1 billion by 2021. The worldwide market for agricultural drones was $494 million in 2015 and anticipated to reach $3.69 billion by 2022. Describes A.I. use cases in 5 areas of ag: precision ag, ag drones, vertical farming, driverless tractors, and open data. Forecasts that all ag providers will become technology providers. Image-guided laparoscopic control, rehabilitation robotics and expanded use of robots in general surgery are on the rise but expansion is hindered by effect of soft tissue challenges, challenge of laparoscope control, and regulatory risk. Wearable robots and exoskeletons, at $36.5 million in 2015, are anticipated to reach $2.1 billion by 2021. Global medical robotics market is expected to reach $11.4 billion by 2020 from $4.3 billion in 2015 at a CAGR of 23.2%. Trends for drones show an increasing adoption of hybrid-fueled drones; a growing adoption of nano drones; increasing mergers, acquisitions and consolidations; emerging drone insurance; declining selling prices; rising product bundling; and increasing regulations for commercial drones. The report forecast the global military ACAS market to grow at a CAGR of 4.5% during the period 2016-2020. Global military UAV market will grow at a CAGR of 4.89% to $13.7 billion by 2026. Press release didn’t provide any teaser or forecast information. The global vertical take-off and landing (VTOL) unmanned aerial vehicle (UAV) market to grow at a CAGR of around 11% through 2020. The worldwide market for military drones is $4.4 bn in 2015 and forecast to Increase to $6.8 bn by 2022. Demand for UCAVs will be very high or high in the US, China, and the UK over the next five years. The global market for commercial drones is projected to grow at a CAGR of over 27% during 2016-2021. The civil unmanned aerial systems (UAS) market is growing rapidly as public agencies are exposed to the benefits of aerial photography, video, and other sensing capabilities. UAV payload and avionics market to grow at a CAGR of 8.3% from 2016 to 2022 and reach over $3.9 billion by the end of 2022. Revenue for wind turbine UAV sales Is forecast to total $6 billion by 2024; support and inspection services $1.6 billion. The worldwide market for smart drone technology (cameras, auto pilots, collision avoidance systems, communication systems, etc.) was $137M in 2015 and is forecast to reach $2.7 bn by 2022. Market for search and rescue and public safety drones is forecast to grow at 127% through 2021. Forecasts the segment to reach a market value of $5.0 bn by the end of 2021 and that worldwide consumer drone unit shipments will increase from 6.4 million in 2015 to 67.7 million units annually by 2021. The worldwide market for camera drones is $2 billion anticipated to reach $21.5 billion by 2022. Report combines a market and technology forecast with an operating concept and buying guide for the first responder industry. The sensors for drones and robots market is expected to grow at a CAGR of 12.4% from 2015 to 2021, reaching a total revenue of $709M by 2021. Small drones include medium, micro, mini and nano-sized drones but all vendors seem to be multi-rotor. The UAV propulsion market is forecast to capture a market value of $2.7 billion in 2015 with gas turbine engine segment the highest share followed by piston, wankel, solar power, electrically powered and hybrid systems. The worldwide market for drone transponders is forecast to Start from zero and reach $2.5 billion by 2022. The LiDAR drone market was valued at $16.1 million in 2015 and is expected to reach $144.6 million by 2022 at a CAGR of 35.2% between 2016 and 2022. The fact-based backbone for many of these research reports is the International Federation of Robotics (IFR) annual World Robotics Industrial Robots and World Robotics Service Robots reports. 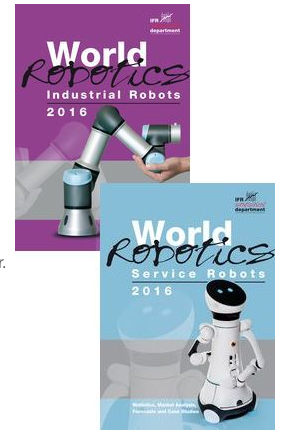 These two books represent the official tabulation from all the robot associations around the world.